“The first week of the Room to Play project was a very exciting and engaging session with an eclectic group of artistically inclined people, each with a uniquely keen interest into the potentially eccentric work ahead. We spent the first portion of our day taking the phrase “room to play” quite literally. An afternoon was spent experimenting with collections of toys and board games in an attempt to understand what defines games. After some thought, it seemed as if the most common answer was rules. By establishing rules upon toys, we can turn them into games. By understanding the rules of a game, we can bend them; make a game more than it is. It seems simple (perhaps it was) but the core idea behind it seemed to be to encourage us to think differently. If we challenge the norms of games such as Twister or Dominoes, perhaps we can create something new and exciting; if not at least original and interesting. Ultimately, it was a lot of good fun and a great way to get to know the team we were working with. After lunch we gathered again within the studio. 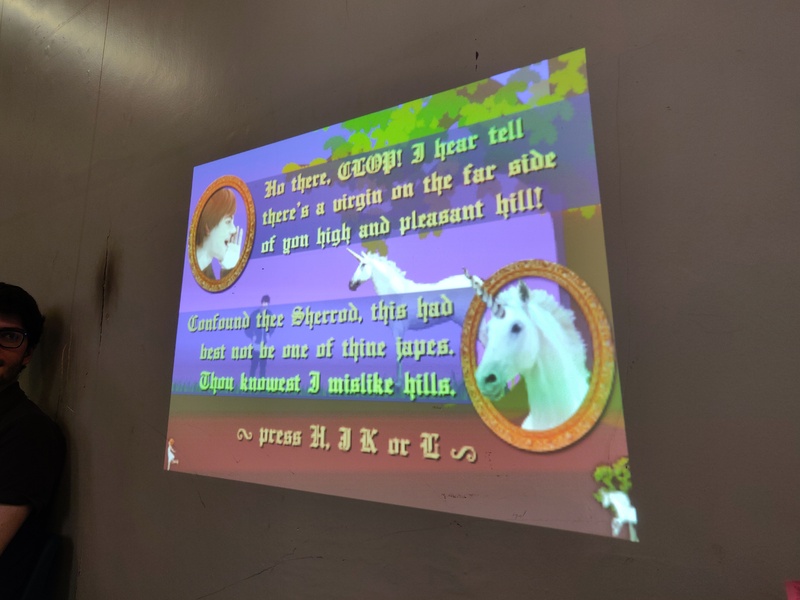 Yann pulled out a laptop, set up a projector, and a unicorn illuminated the wall — wonderful. The unicorn was the main character of the video game CLOP, where the main objective was to get the unicorn from one end of the track to the other using four buttons that control each leg independently. The game is primarily intended for one player but by using four giant controllers, each with one big button on them, the game became a more collaborative process. Therefore the group playing had to create a shared sense of rhythm in order to complete the game. We ended the afternoon by making our own little controllers with a mix of buttons and copper tape, which we then combined together to create one giant instrument in which we each controlled a separate pitch. In the multiplayer version of CLOP, if the players don’t communicate then the unicorn inevitably crumbles to the ground. In a similar fashion, without communicating how to play our giant collaborative instrument the sounds cluster and stumble over each other. However, by working together we could create an array of delectable melodies and a shared sense of rhythm. –Liam Dempsey (Room To Play Artist).